Visualize a robot designed to tidy your home: roving about, organizing dirty dishes into the dishwasher and stray socks into the laundry. Such a useful helper at the moment may be in the science fiction realm; however Caltech researchers have managed to develop an autonomous molecular machine that can perform similar operations—at the nanoscale. This "robot," composed of a single strand of DNA, can independently "walk" around a surface, pick up specific molecules and drop them off in selected locations. The research was conducted in the laboratory of Lulu Qian, assistant professor of bioengineering. Details of the research appear in a paper in the September 15 issue of Science. Just like electromechanical robots are sent off to faraway places, like Mars, we would like to send molecular robots to minuscule places where humans can't go, such as the bloodstream. 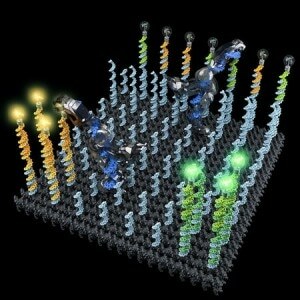 Our goal was to design and build a molecular robot that could perform a sophisticated nanomechanical task: cargo sorting. Guided by former graduate student Anupama Thubagere (PhD '17), the Caltech team built three regular building blocks that could be used to assemble a DNA robot: an "arm" and "hand" for picking up cargo, a "leg" with two "feet" for walking, and a segment that can identify a specific drop-off point and signal to the hand to let go of its cargo. Each of these parts is made of just a few nucleotides within a single strand of DNA. In theory, these modular building blocks could be assembled in a number of different ways to complete different operations—a DNA robot with several hands and arms, for instance, could be used to carry many molecules at the same time. In the research described in the Science paper, the Qian team constructed a robot that could explore a molecular surface, pick up two different molecules—a fluorescent pink dye and a fluorescent yellow dye—and then dispense them to two distinct regions on the surface. Using fluorescent molecules enabled the researchers to check if the molecules landed in their intended locations. The robot effectively sorted six scattered molecules, three yellow and three pink, into their correct places in 24 hours. Incorporating more robots to the surface lessened the time it took to finish the task. Though we demonstrated a robot for this specific task, the same system design can be generalized to work with dozens of types of cargos at any arbitrary initial location on the surface. One could also have multiple robots performing diverse sorting tasks in parallel. The key to engineering DNA machines is the fact that DNA has unique physical and chemical properties that are recognized and programmable. A single strand of DNA is composed of four different molecules called nucleotides—abbreviated A, G, C, and T—and arranged in a string known as a sequence. These nucleotides bond in specific pairs: G with C and A with T. When a single strand comes across a so-called reverse complementary strand—for instance, AATCG and CGATT—the two strands zip together in the standard double helix shape. A single strand possessing the right nucleotides can push two partially zipped strands to unzip from each other. How rapidly each zipping and unzipping event happens and how much energy it consumes can be predicted for any specified DNA sequence, allowing researchers to regulate how fast the robot travels and how much energy it consumes to do a task. Furthermore, the length of a single strand or two zipped strands can be measured. Therefore, the leg and foot of a DNA robot can be engineered for a preferred step size—in this case, 6 nm, which is around a hundred millionth of a human's step size. Using these physical and chemical principles, the researchers can create not only robots but also "playgrounds," such as molecular pegboards, to analyze them on. In the present research, the DNA robot travels around on a 58-nm-by-58-nm pegboard on which the pegs are composed of single strands of DNA complementary to the robot's foot and leg. The robot binds to a peg with its leg and one of its feet—the other foot floats free. When unplanned molecular fluctuations cause the free foot to encounter an adjacent peg, it pulls the robot to the new peg and its other foot is freed. This process carries on with the robot traveling in a random direction at each step. It may take a day for a robot to travel the whole board. Along the way, as the robot meets cargo molecules tied to pegs, it grabs them with its "hand" parts and carries them around until it detects the signal of the drop-off point. The process is slow, but it allows for an extremely simple robot design that utilizes very small quantities of chemical energy. We don't develop DNA robots for any specific applications. Our lab focuses on discovering the engineering principles that enable the development of general-purpose DNA robots. However, it is my hope that other researchers could use these principles for exciting applications, such as using a DNA robot for synthesizing a therapeutic chemical from its constituent parts in an artificial molecular factory, delivering a drug only when a specific signal is given in bloodstreams or cells, or sorting molecular components in trash for recycling. The research paper is titled "A cargo-sorting DNA robot." Besides Thubagere and Qian, other co-authors are postdoctoral scholar Wei Li, graduate student Robert Johnson (BS '15), former visiting student Zibo Chen, former undergraduates Shayan Doroudi (BS '13), Yae Lim Lee (BS '12), Gregory Izatt (BS '14), and Sarah Wittman (BS '13); former graduate student Niranjan Srinivas (PhD '15), former senior research fellow Damien Woods; and Erik Winfree (PhD '98), professor of computer science, computation and neural systems, and bioengineering. The study received funding from Caltech Summer Undergraduate Research Fellowships, the National Science Foundation, and the Burroughs Wellcome Fund.